Skylon Tower opened its “revolving doors” in 1965. Situated on the Canadian border of Niagara Falls, it is a staple among tourists visiting both the Canadian and American sides of the falls. In the 1970’s and 80’s the Tower updated its features to include two Starbucks franchises and the Fallsview Casino. Since then not much has changed by way of design or function. The casino is accessible by bridge connecting it to the Tower and stands 520 feet above street level. If you are daring enough to take the Tower ride, a warning, the elevator is semi-open to view the outside….. and the dining rooms are at the very top. 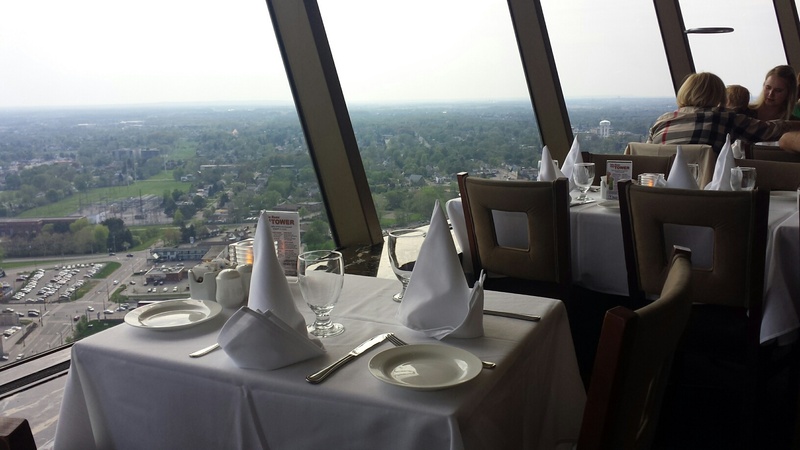 The 360 degree revolving dining room gives you spectacular views of Niagara Falls, and its copper roof mimics Château Frontenac in Quebec City. Both worth noting. My husband and I made the forty minute drive to Skylon for dinner. Now, I have been to Canada many times; Montreal, Toronto, Niagara on the Lake, and Mont Tremblant. So needless to say, when we arrived I was thoroughly excited to experience flying up fifty some-odd-levels to get to the dining room where we would experience grandeur, uniqueness and killer views. I do love Canada. My excitement lasted roughly ten minutes. As we walked into the base of the Tower, we were jostled about as tourists pushed by to make their way to the 3D/4D theater. Counters line its base, some for observation deck check-ins, some for tourist photo-ops, and some for gimmicky retail sales. We walked up to an information desk and asked how to get up to the Tower for dinner. We were told to take the elevator on the left. The “I can’t be bothered” hostess then pointed to a line tapped off to usher people through. Questioningly I followed my husband over to a theatre-style booth where an attendant gave us some sort of ticket and said please make your way over to the green screen. The screen is located half-way down the sectioned-off area and you have to go past it to get to the elevators. The green screen is just that–a green screen. Another lady takes our “ticket” and tells us to stand in front of this screen and smile pretty. Then takes a secondary shot where she tells us to act like we are falling. Ok? Really? I just want to go upstairs and get a drink; is this really necessary? Once done, we finally get over to the elevator, where my excited husband is as giddy as a schoolboy who’s about to meet John Cena! Hint, he loves roller-coasters so the idea of ascending up fifty something levels to a restaurant, all while viewing the great outdoors thrilled him. Me not so much. I held my stomach and peeked through veiled eyes as we made our way to the top. Once we arrived we first went out to the observation deck, one more level up. The views are breathtaking. All dressed up and feeling very romantic, my husband and I held hands, teetering near the needle of the rooftop, enjoying the amazing views of the Falls. It was a gorgeous summer night–we couldn’t have asked for better weather. Reviling in the romance, we took our time and walked around. When we headed back in for dinner, my excitement was renewed. I couldn’t wait to sit down at an elegant table, watch the world go by, and eat a delicious 4 star cuisine. The tables are indeed elegant, with white linen tablecloths, perfectly folded napkins, lit candles and little cards explaining what you are looking at out the windows. As you rotate there are little plaque’s at each window explaining either historical moments of Niagara Falls or a piece of history about the particular view you are taking in at that moment. It’s pretty amazing. I was finally thinking, “Ok, we’ve past the touristy stuff and we are now enjoying elegance, fine-dining and taste.” After ordering some wine, we ordered the Canadian Smoked Salmon appetizer. Wild Pacific Cold Smoked Canadian Salmon with capers and horseradish on pumpernickel ($16.00). While the sizes are a bit petite, the app was truly tasty. It had a mild zing to it from the horseradish, and the salmon was cold, fresh (non-fishy tasting), with a beautiful dark pink color. The capers add a nice tartness to round out the flavors. Still revolving around the Falls, I sat back and took it all in. Now this was dining at its best, I thought. We then ordered our main dinners. 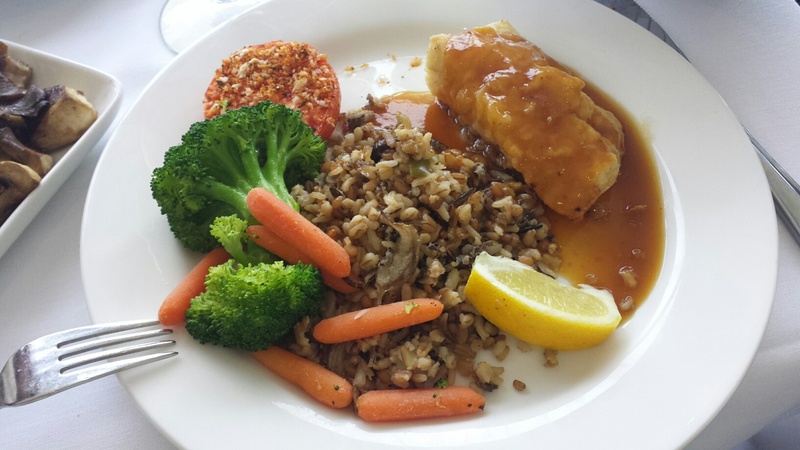 Mine–Chilean Sea Bass, the Tower description has it as a “Light Flaky White Loin, with a Soy Citrus Glaze. Served with Rice Pilaff.” ($49.00). My husband ordered a Filet Mignon with Red Wine and Béarnaise Sauces ($55.00). This is about the time everything went south. Our waitress came by two times. Once to take our order, the second to deliver our meals. Other than that, we were greeted by a secondary patsy who filled our water and wine glasses…and ultimately delivered our check. When the meals arrived, we dived in. Starving by that point as our meals took some time to arrive to us. While we waited, we watched as patrons around us were approached by a tuxedo wearing young lady who insisted on taking pictures of them. These pictures, however, aren’t free. No no no. Even though you are paying roughly the same amount I would pay for a Longchamp bag (actually dinner was more), you still have to pay upwards of $30.00 to keep the picture. How do I know this? Because the table next to us decided to order their picture. Of course the tuxedo wearing picture taker came back to redo the pictures because the first set were “god-awful” according to the patron. Then she came back again because she couldn’t print out the second set….but ironically the “god-awful” set was fine and she could print those. To my surprise, the lady still ordered a picture she didn’t want! This was about 25 minutes worth of intrusive time from their romantic dinner. Thank goodness we weren’t bothered. When our meals did arrive, upon my first bite I was immediately taken aback. The Chilean Sea Bass was not only under-cooked, but fishy tasting and slimy. It was so disgusting, (mind you I am a Sea Bass/Salmon expert–really, I order it more than enough and have cooked both too many times to count). I attempted to get our waitress’s attention, but alas she would not come our way. I tried desperately to eat my fish as best I could. Why? Because that was a $49.00 Sea Bass! The rice pilaff was good though. My husband’s steak was well-done–he asked for medium rare. And for a$55.00 steak, it was rubbery and barely seasoned. That was a $18.00 worthy steak; still it was much better than mine. Having choked down what I could–which wasn’t much, we decided to cut our losses and go somewhere else for dessert. Even with a gift card we had received (gracious and thoughtfully), we still paid over $80.00 out of pocket! When we got to the bottom of the Tower, of course we wanted to see how our green screen photos turned out. We handed out ticket to a guy behind the photo counter and he pulled up the images. Both images are of you photo-shopped in front of the Falls. Seriously! I thought it would just be a nice picture of us. But instead of taking advantage of the views they have literally out their back door, they photoshop it in!!!! Oh and you have to pay $25.00 for one picture. When I refused, he tried to haggle with me and offered it for $20.00. Nope! On to dessert. Had I known that getting dessert would be another uphill battle, I would have cut my losses all together and gone home. Calling ahead of time to the Brazilian Steakhouse (Brasa) across the street; I told the hostess that we could be there in ten minutes and would just be ordering desert. She took our names and we scurried over. I was hoping to have my romantic nigh renewed. The menu for their desserts looked amazing and different than your typical creme brulee, brownie with ice cream or chocolate or cheesecakes. It was busy with tourists but by no means packed. We gave our name and took our seats on the outside balcony. Our waiter came by and gave us dinner menus and asked if we wanted drinks. Yes to the drinks, no to the dinner. “We just want to order dessert and wine,” I said. His face slumped into a frown and he paused before saying, “I will need to check with the manager.” Then he walked away. When the manager came out, he told us very rudely, “We do not serve only dessert. You must order dinner first, we have other patrons waiting to sit.” What!!! The balcony was empty–as I pointed out to him, we were going to order a $25.00 bottle of wine–also pointed out to him, and called ahead and was not informed this–again which I politely told him. Nope, no can do. You either order the set menus; if any of you are familiar with a steakhouse like this you know that most dinners cost upwards of $50.00 each, or you leave. We were ushered out and told we could sit at the packed bar if we wanted. No thanks, not on my romantic date night! We walked the very touristy streets to two more restaurants (neither of which offered dessert menus), before finally landing at a very touristy and chain restaurant to sit at a bar, because they couldn’t seat us. Their only deserts were the typical (mentioned above). So I ordered the creme brulee, blah blah. Hubby ordered the brownie sundae, blah, blah. Needless to say, after spending around $200.00 out of pocket, and an $80.00 gift card, I still arrived home that night starving and quite annoyed. The upside, I loved the views, had a great time with my husband (who tried desperately to save the evening), and got to enjoy a nice summer evening. 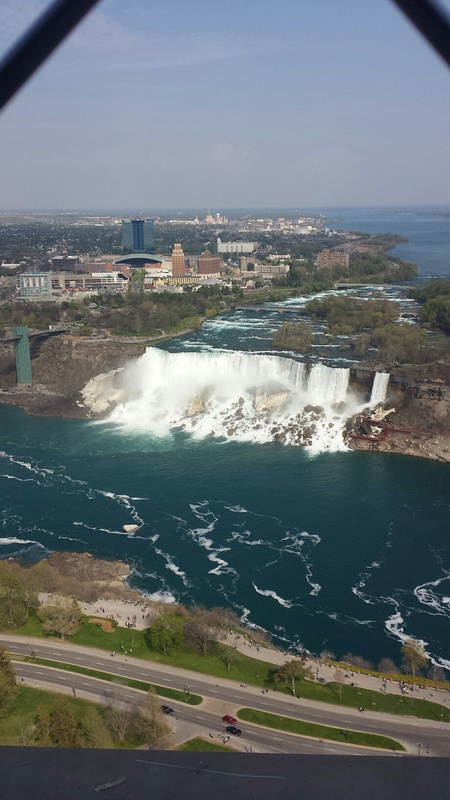 However, I will say, I will NOT ever go back to Skylon Tower again, and I was less than impressed with the Canadian side of the Falls. So touristy, their’s no uniqueness to the Canadian culture. Half the restaurants are chains that we have here (with the exception of maybe a handful). But, I wouldn’t be a food critic, if I only went to the best restaurants and always had great experiences. So fare warning to all who venture out that way…..